Home | New Releases | Abraham Hunter Artist Signed Hand Embellished Limited Edition Canvas Giclee:"Risen"
Abraham Hunter Artist Signed Hand Embellished Limited Edition Canvas Giclee:"Risen"
Edition: Artist Handisgned and Numbered to 700 total editions. COA included. About the Art: When I set about to paint this piece, I kept asking myself what it would be like to be in the tomb that morning? To feel the cold hard stone, the foreboding of deaths sting, and the deep darkness that surrounds you in the cave. It would be more than enough to engulf you with the despair and grief that Christ�s disciples felt after His death and burial. Life without Him is just too dark, unforgiving, empty, and difficult to bear. In this painting, I didn�t want to only show the light and power of Jesus resurrection� I wanted you to participate in His death and victory over death. 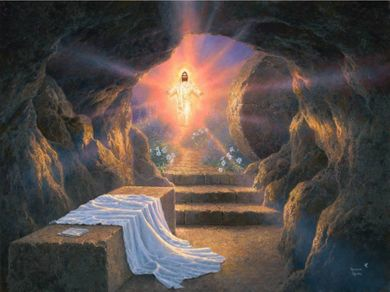 When I look into this painting, I feel like Jesus is calling me out of the darkness of death in the tomb, and into His glorious light! Through His power, I can go step forth from the void and join Him in the abundance and life that we find as we draw nearer to His light! No thank you, I just want the unframed Giclee on Canvas 18 x 24. Home | Fine Art Prints & Limited Editions | Infinity Fine Art | Abraham Hunter | Abraham Hunter Artist Signed Hand Embellished Limited Edition Canvas Giclee:"Risen"
Home | Framed Art | Religious Art | Abraham Hunter | Abraham Hunter Artist Signed Hand Embellished Limited Edition Canvas Giclee:"Risen"